Did the pilgrims really gamble on Thanksgiving? If you’re like most Americans, you look forward to Thanksgiving. Whether you travel across the country to assemble with family and friends, or whether you’re hosting loved ones at your own home, it’s the biggest holiday of the year and a weekend everyone looks forward to. Bigger than Christmas since all religions take part in Thanksgiving celebrations, the holiday is an opportunity to give thanks for what we have and celebrate the end of the year and what’s to come. But it’s not all about sitting around feasting and talking. It’s about relaxing, playing games, and having fun. In my house, for example, we enjoy a Thanksgiving feast on Thursday, which usually goes from lunch through to dinner, with different family members coming and going. Friday, it’s all about working off that food with a game of football in the park. We usually have about 25 to 30 people staying with us (in very cramped quarters) so it’s a good number for a fall pigskin classic. And the weekend? Well, Saturday and Sunday is reserved for playing games. The kids usually end up playing Junior Monopoly. And while the adults to partake in board games, many of us hop online and play online slots at sites like Palace of Chance. And table games, too. Pretty much every casino game available. The answer? Not at all. In fact, gambling and Thanksgiving couldn’t be any more synonymous. After all, the Pilgrims didn’t just enjoy a feast with the Natives. Together, they gambled during that first get together. Many people believe that the first Thanksgiving was a solemn affair. Some even mistake it for being religious. But the truth is that it was neither. 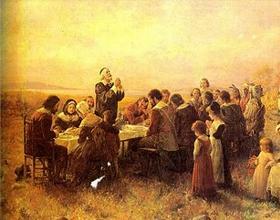 According to historians, the first Thanksgiving was a 3-day harvest festival, and a jovial one of that. It included drinking, gambling, and all kinds of other games. In fact, during the first Thanksgiving, the Pilgrims didn’t eat turkey. They ate deer. We’re not kidding. But back to gambling. Native Americans were gambling way before the English landed on US shores. Historians note that Native Americans played stick and straw games, wagering on things like bows and arrows, plus other good stuff like hatchets, leather coats, and even copper beads. And because the colonists are known to have brought some form of gambling over to America when they arrived, it’s fair to assume that gambling became common ground at that first Thanksgiving feast shared by the Pilgrims and the Natives. If you want to recreate that first American Thanksgiving, we say eat turkey instead of deer and play casino games for real money instead of stick games for hatchets. Palace of Chance has the best selection of games and you don’t even have to play for real money. So fire up your PC, Mac, smartphone, or tablet and enjoy your favorite games for free. All it takes is a free account to get started. Happy Thanksgiving from everyone at Palace of Chance!